I got an email last night from an old friend who was wondering if i knew that my website was now ignoring his attempts to add comments to my posts. Hmmm, i thought, this guy is very computer savvy, so the odds that he is doing something wrong are negligible. I started digging around in the administrative area of this site and immediately discovered that starting in the middle of last January dozens of comments had been sitting there patiently awaiting my approval. What!!@!#! i shrieked. Nonsense! WordPress sends me an email ten seconds after someone has submitted a comment. Or well, they used to. But with perfect timing they stopped last January just as i was getting caught up in six months of jumping through hoops to get approval for my move to the senior housing in San Francisco followed by a month of packing and moving. And once i got here, as a bird turned loose, i was too busy to dig into the question of comments. Although yes, i did at one point wonder how come nobody was leaving me comments anymore. So this morning i went through all the comments that had stacked up since last January. About half of ’em were from folks who were trying to disguise links to their commercial sites as praise for my writing. Those were easy to deal with, just brand ’em “SPAM” on the forehead and cast ’em into eternal darkness. All the others – discerning, witty, and kind to a fault – i approved and replied to. My apologies for the delay to Andrew, Carol, both Davids, Jo Ann, Kobe, Laura, Laverne, Rick, Scott, and Sharon. Ya’ll please try again sometime when you see something worth commenting on. Now all i have to do is remember to check for new comments every morning….at least until i can get WordPress to notify me when there are new ones awaiting approval. 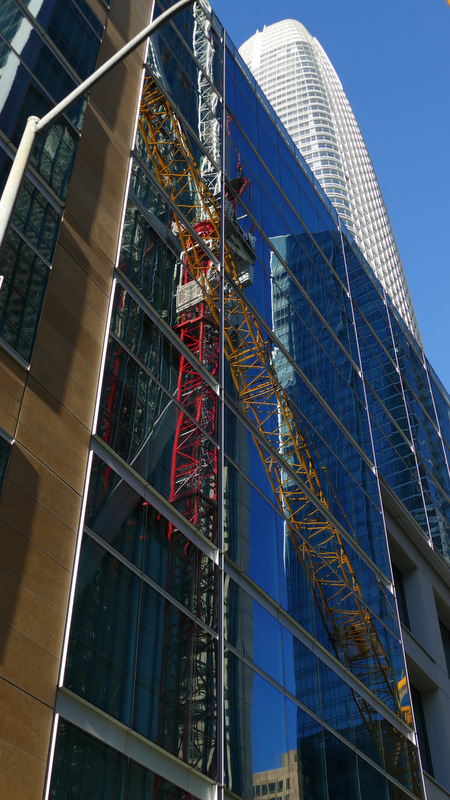 Meanwhile, here’s a little construction scene on the new Transbay Terminal with the Salesforce tower in the background.